Level can be measured from 0-6 psi (13.8 feet of water) up to 0-60 psi (138 feet of water) with the Model 675. The power supply is 12-40 VDC, but limited to 28 VDC for IS applications, and provides an output signal of 4-20 ma. All Model 675 level transmitters are equipped with a sealed cable termination area and moisture absorbing desiccant canister to help prevent moisture from entering the transmitter through the cable vent. 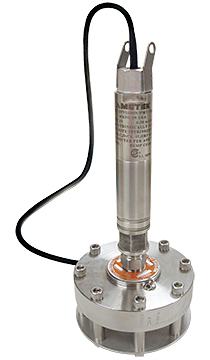 The 675 submersible level transmitter is manufactured in the USA.